The Bureau of Labor Statistics (BLS) released the Employment Situation report for February. 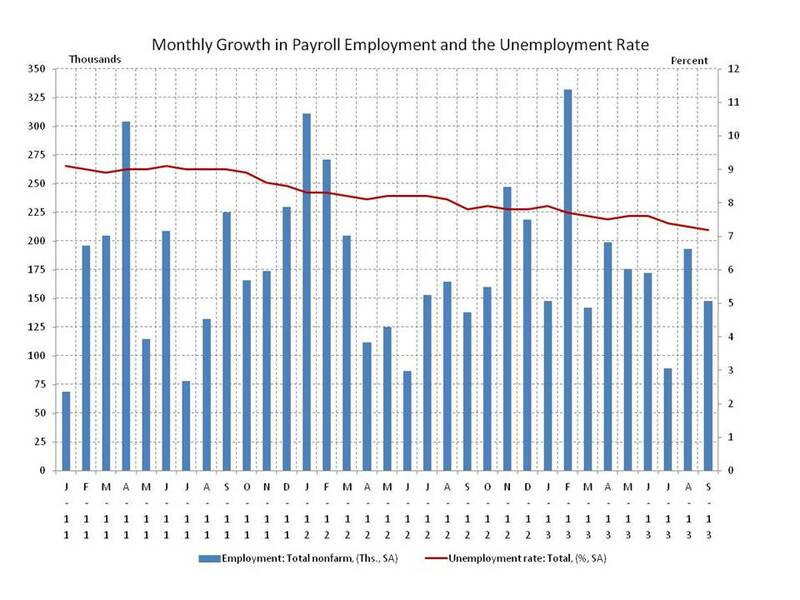 The establishment survey showed payroll employment expanded by 175,000 in February and the prior two months were revised upward for a combined increase of 25,000. From the household survey, the unemployment rate reversed last month’s decline, rising back to 6.7% from 6.6% in January. The labor force expanded by 264,000, the number of employed persons increased by 42,000, and the number of unemployed persons rose by 223,000. The return to more robust growth in February payrolls is a positive signal after the disappointing slowdown in December and January. Indicators from the household survey regarding missed work due to bad weather suggest that the February gain could have been larger absent winter storms during the month. These “missed” jobs could provide a boost to payroll growth in the March report. The increase in the unemployment rate could be a blessing in disguise if it represents the beginning of more consistent growth in the labor force, drawing back discouraged workers who have given up the job search in recent years. In any event the uptick in the unemployment rate will have no impact on the Federal Reserve’s pace of reductions in bond purchases. An expanding labor force will bolster the Fed’s confidence, rather than undermine it, that the recovery is proceeding, and the Fed will continue its measured reductions in the pace of bond buying at the upcoming March meeting. Today’s report is not as strong as it might have been but still has plenty of positive signals. The Bureau of Labor Statistics (BLS) released the Employment Situation report for January. The report was disappointing overall but had a mix of good, bad and extenuating circumstances to keep the labor market outlook in limbo for a second month. The establishment survey showed payroll employment expanded by 113,000 in January, following an upwardly revised 75,000 increase in December. The average monthly gain was 205,000 over the prior 12 months. These two months were the weakest since the spring slowdown in 2012, but were likely depressed by extreme weather. According to the household survey, the unemployment rate dipped to 6.6% from 6.7% in December and 7.0% in November. The January decline was based on an increase of 616,000 in the number of employed persons that outpaced an increase in the labor force of 499,000. Both developments, an expanding labor force and an even greater expansion in employed persons are positives. In contrast, the November to December decline was based on defections from the labor force outpacing gains in employed persons. The bulk of the decline in the unemployment rate from its peak has come from labor force defections, so the January figures are a bright spot in the report. Average hourly earnings ticked up and the length of the workweek held its ground, adding some additional modest ambiguity to an otherwise disappointing report. With all eyes on the Fed, and all Fed eyes on the monthly labor reports, today’s report sheds little light on the Fed’s next move. Being neither strong enough nor weak enough to force the Fed’s hand on the pace of withdrawing its monetary stimulus, today’s report leaves it to next month to determine whether the labor market is moving forward, backward or nowhere, and whether the Fed will follow. 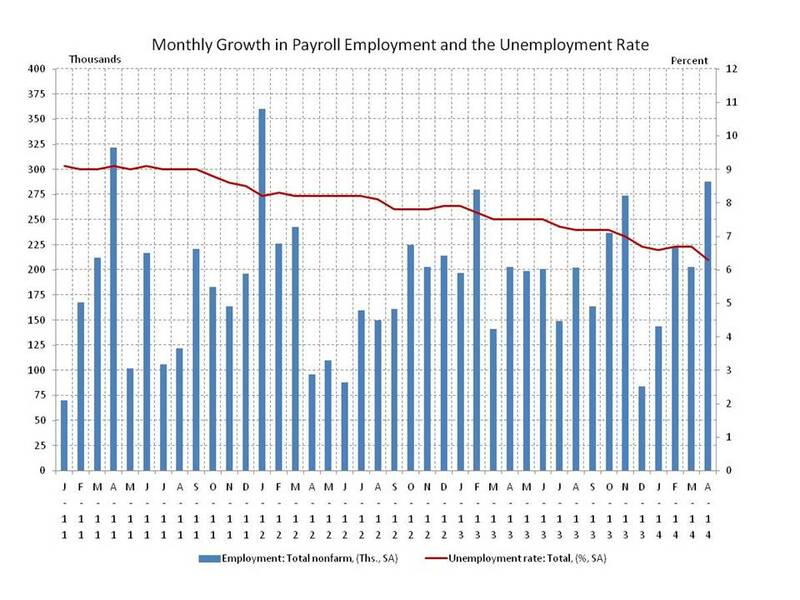 The Bureau of Labor Statistics (BLS) released the Employment Situation report for November. 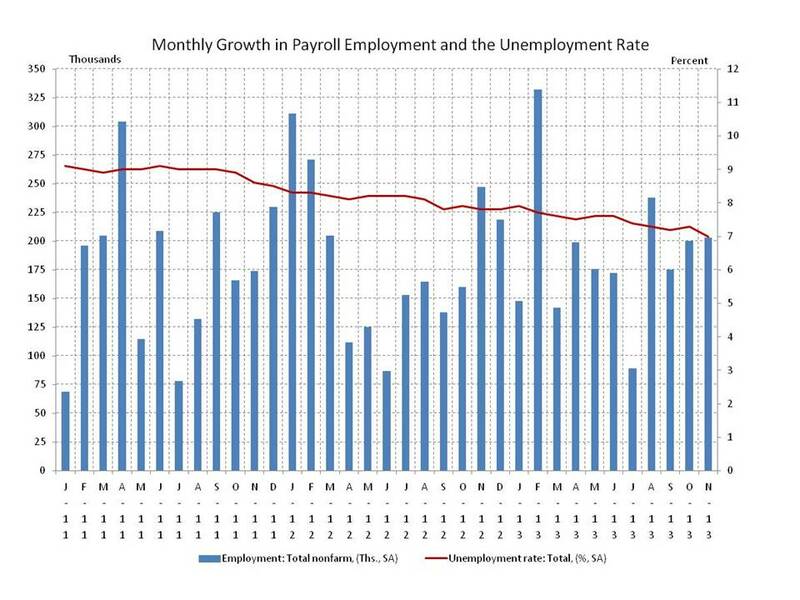 Payroll employment expanded by 203,000 and the prior two months were revised for a net increase of 8,000. The pattern in job growth is beginning to look like the substantial and sustained improvement in the labor market that the Federal Reserve has identified as the condition for beginning the process of winding down its bond purchases, popularly referred to as QE3, the third round of quantitative easing. The unemployment rate declined to 7.0% from 7.3% in October, but this sharp decline should be viewed with some skepticism. The household survey treated furloughed federal government workers as unemployed in October and employed in November. The large number federal workers changing status combined with federal workers that were misclassified in October and large swings in and out of the labor force in October and November suggests the drop in the unemployment rate may be distorted by procedural problems related to the furlough. Possible technical problems in the unemployment rate aside, recent growth in payroll employment may convince the Fed that the labor market is healthy enough to begin easing monetary stimulus. The earliest possibility is the December 17-18 FOMC meeting. Fed officials have been reluctant to set a specific date or take any date off the table. December is a possibility but not a certainty. One thing is clear, absent any significant setback in labor market conditions the winding down of QE3 will begin sooner rather than later. The Bureau of Labor Statistics (BLS) released the Employment Situation report for October and the results are all over the map. Because of different definitions used in the surveys, the impact of the partial federal government shutdown was negligible in the establishment survey but substantial in the household survey. 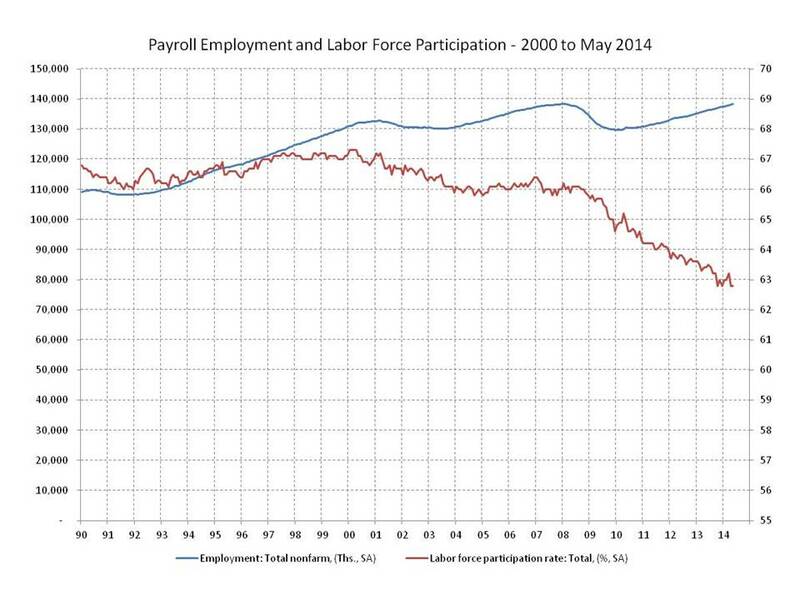 And unrelated to the shutdown and furloughed federal workers there was a sharp decline in the labor force. The report is good, bad or inexplicable depending on which part you focus on. 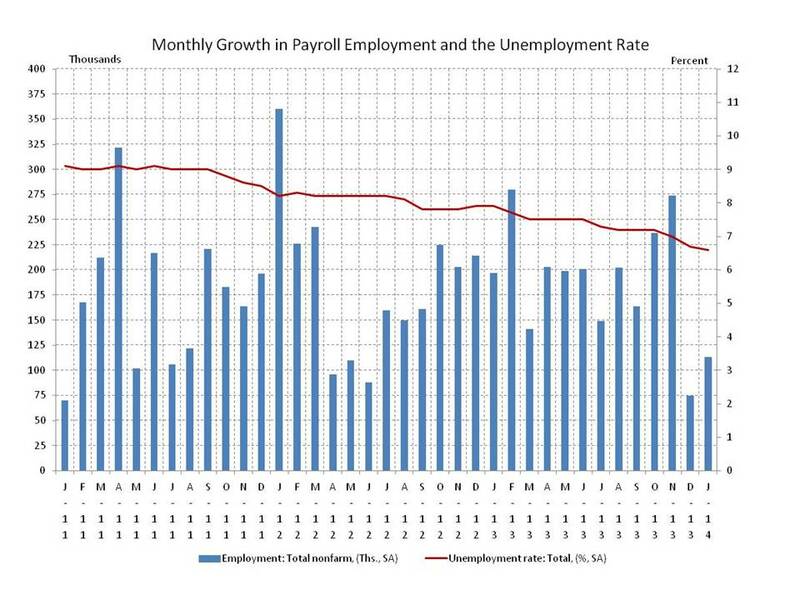 The establishment survey was stronger than expected showing payroll employment expanded by 204,000 with the private sector adding 212,000 and the government sector subtracting 8,000. The establishment survey counts people who worked or received pay, so the furloughed federal workers were treated as employed. That’s the good part of the report. The household survey categorized the furloughed federal workers as unemployed on temporary layoff and included a 448,000 increase in that subcategory of the unemployed. That’s the bad part of the report. But the number of employed persons declined by 735,000, the number of unemployed persons increased by only 17,000, and the number of persons leaving the labor force increased by 720,000. That’s an extremely large number of persons leaving the labor force and an extremely large gap between the decline in employed and increase in unemployed persons. That’s the inexplicable part of the report. The unemployment rate ticked up to 7.3% from 7.2% which the BLS characterized as “little changed.” It really amounts to rounding back up the small change that was rounded down last month (0.04%). It’s difficult to interpret this report. Expectations were for a soft report based on shutdown-related malaise, without regard to how the federal workers were categorized. This report defied all the expectations. The government shutdown caused a data blackout at the federal government statistical agencies. The lights are back on but the view could be better. The Bureau of Labor Statistics (BLS) had the employment data collected but the processing and release was delayed by the shutdown. The Employment Situation report for September was softer than expected. From the establishment survey, total nonfarm payrolls added 148,000, with the private sector adding 126,000, a substantial slowdown from earlier in the year. The government sector added 22,000, mainly in state government education. The previous two months were revised upward by a total of 9,000. From the household survey, the unemployment rate slipped to 7.2% based on weak labor force growth, moderate employment growth and rounding. The unrounded rate declined from 7.28% to 7.24%.